Customer experience is the next battleground. Are you ready? Customer service has always been a critical part of business. Yet with the rise of social media, where consumers can comment on and interact with companies in real-time, expectations have changed dramatically. Companies are now expected to support customer service inquiries over Twitter, Facebook and live-chat, in addition to email and phone. And as it becomes easier to track down individual employees from companies via sites like LinkedIn, each and every one of your employees are now on the front lines of customer service. In such a high-stakes game, help your company stay ahead by providing customer service training all your employees can find useful. Your business would not exist without your customers, but too often this fact gets lost in the day-to-day operations of the organization. Great for new employees or energizing your current team, this course uses humor and situational videos to demonstrate the importance of customer service at your company. Learners will leave the course understanding their value to the business, as well as how great customer service can be personally satisfying. 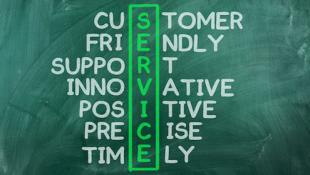 What is your company’s customer service philosophy? If you’re unsure, or your company lacks a philosophy all together, this course is for you. Equip your team with the skills they need to overcome customer obstacles and constantly improve the quality of your customer service through practical knowledge and techniques. This award-winning course is designed to improve HCAHPS scores and teach healthcare staff to understand the effect of their actions and attitudes on the patient and perception of care. Assume the role of five characters as you play through interactive situations exploring the service and care side of healthcare. This two-hour course also includes branching scenarios, simulations and job aids for use as a refresher in the workplace.